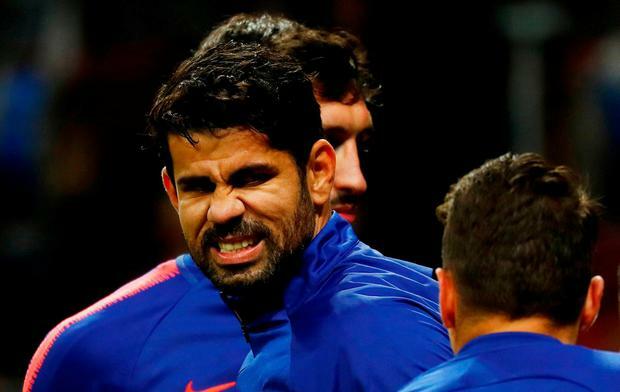 Diego Costa has been handed an eight-game ban for his actions towards the referee in Atletico Madrid's defeat to Barcelona on Saturday night. Barca ran out 2-0 winners at the Nou Camp, with late goals from Luis Suarez and Lionel Messi almost certainly handing the defending champions a fourth title in five years. The goals came with Atleti down to 10 men following Costa's first-half dismissal for comments made to referee Gil Manzano. The Spanish authorities have now taken action handing the Spanish international a four-game suspension for the comments and a further four-game sanction for grabbing the referee's arm. Costa has also been fined €6000. Atletico have the power to appeal against the decision. Teammate Koke revealed that Costa had apologised to rest of his team and had insisted he had not insulted the referee and that comments were aimed at himself. “Something always happens to us when we come here,” added Koke. "In the last 11 games, I think there have been seven red cards and not all of them have been fair. "We must try to stay as high as possible in LaLiga. We will have to watch what happened [against Barcelona]. "What we talk about stays inside the dressing room and no one has to know [what is said]." Independent.ie Newsdesk Fleetwood manager Joey Barton says he "emphatically" denies all allegations made against him following Saturday's defeat at Barnsley.